So right now, our plan is round 11, this gives us 28 days to hopefully find the best direction. We will be back in Michigan for scans in January. Just know It's hard to make the best decisions, but today we are thankful that Emily is here with us for another Thanksgiving and thankful for everyday she is here and can continue the fight with her beautiful smile. 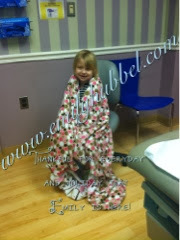 Thank you Binkeez for Comfort for sending this wonderful blanket to Emily, she loves it, it is so soft. 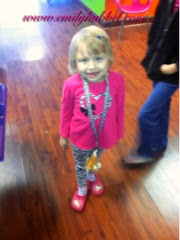 November 30 is the last day to use the "Emily10" code on smilemakers.com to get 10%off bandaids and free shipping. We are able to continue to receive bandaids up through December 5th, because our plan is to present them to VCU about the 2nd or 3rd week in December. As of last night, we are almost at 2000! Our goal is over 3000, so keep ordering and sending them in. You guys are doing amazing. Address is PO Box 5383, Midlothian, VA 23112! The list could go on and on and we don't want to forget anyone, because even one box brings a smile to the kids here in the clinic!!!!!! THANK YOU!!!!! Happy Thanksgiving. Remember to hug and kiss your kids and tell them how much you love them! After a late night, Emily had a long day in clinic. She was accessed and thankfully on the first time. By time labs were back, it was already past time of going to get MIBG injection, so they were coming to the infusion room. Emilys hemoglobin took a huge drop from 10.9 on Thursday of last week to 8.8 today. WOW! Platelets were 29, so she needed platelets. Just an extremely long day. Today for the first time Emily played with the childlife here in Michigan and she had a good time, but as many times as we have been here Emily has ever played with her. So that was nice. After a long day, we ar back in the Renucci House and Emily had a snack and she is already asleep. Anxiety is awful here and dad and I have lots of anxiety. Ready for this to be over. So we are on our way to Michigan. UGH!!!!! Last night we made it to our half way point. We are always thankful to have our wonderful friends Sue and Jojo in Pittsburgh, PA (our half way point) who always have dinner ready for us. Thank you! Today we will travel the rest of the way to Grand Rapids, MI. Thankfully we were able to stay in the Renucci House this time. 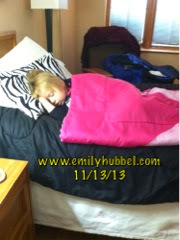 December 23 ", 2013 we will be reaching Emily's 3 year mark of battling with this disease. December 18, 2010 was when the journey started and we didn't know what was wrong. 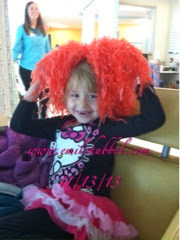 December 23, 2010 she was diagnosed with stage IV neuroblastoma and we weren't given great news for outcome. 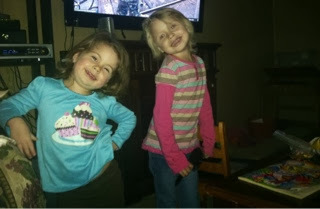 November 16, 2011 when Emily was going to CHOP to start antibodies, we learned that she had another spot on her lumbar, L4, which was progression. 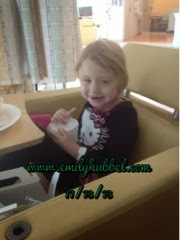 December 20, 2012 after Emily had 3 rounds of the compassionate antibodies, Emily progressed with several places including her skull and more spots on her back. So here we are in November again! Scans at the end of the year! Why did I tell you all that? Our anxiety is off the roof right now. The end of the year we tend to have news we don't like. News that takes us to other places. Sleep isn't happening much, no patience in sight, and just all the fear. Spread this around and tell everyone. Last year we collected 3000 boxes, this year we would like to collect over 4000. We have started the "Emily's 2nd Annual Band Aid Drive" Last year we collected over 3000 boxes to donate to hospitals in need of band aids and this year we would like to match that number or exceed it! So, lets start sharing this event, share wtih your friends, family, work, coffee shop or anywhere that will let you share it. We want to bring a lot of smiles to the children fighting cancer. Thank you to SmileMakers for helping us again this year!!!! 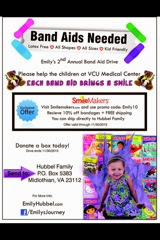 We hope you can help by bringing a smile to Emilys face by helping bring smiles to all the kids who use the band aids in the clinics, ER and Floor 7 at VCU and other hospitals that may need them!!! It is the million dollar question that gets asked often and normally the first question we are asked. Overall Emily is doing well. Round 10 was actually delayed by a week because her platelets were not recovering. They were at 19 and held the round off and gave her platelets. When she went the next week to start they were 23. Dr Gowda actually likes them at 30, but allowed her to start with platelets on board. Day 4-9 was her chemo, and she already started the not feeling hungry and very tired before the chemo started. So, once the chemo started it was even worse. Dad tries to go everyday that he can to have lunch with her at school to make sure she eats. This past week she was scheduled to go Friday to have her counts checked, but we noticed Wednesday night that she was bruising pretty bad and Thursday morning she had petechia on her arm. When counts came back, everything actually dropped. Her ANC although not completely low, but it was the lowest it has been in a while, so we are just keeping watch to make sure she doesn't get sick. Platelets were down to 13 which is the lowest that they have been in a long time. So, they gave her 3 units of platelets and want her back tomorrow to check counts and most likely getting platelets. So all weekend including Halloween night we have been very careful to make sure she doesn't hurt herself. She didn't make it long Halloween night though because she was so tired from a long day at clinic and the chemo she is on. Thursday will be day 15 of avastin and complete this round. 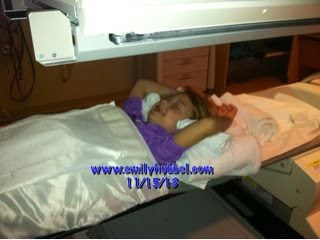 We just learned Friday that Emily will be heading to Michigan the week of November 11th for scans on Wednesday and Thursday. It makes it really hard to make any set plans when you don't hear in a real timely fashion that you have scans, but it's been what we have been used to for the last almost 3 years. Scanxiety has already started, especially saying Dr Gowda feels that after 10 rounds of what Emily is currently on if there is no change, that this is really no longer working to "hopefully" clear her and only keeping her stable. So we really aren't to sure what will be next for Emily. I know that Dr Sholler has been pushing DFMO, but compassionate trial of DFMO (if she has disease she would not be eligible for the DFMO trial) would only keep Emily stable, and our hope is to get her clear. The fear of keeping disease always means there could be progression like she had last year. So, how is Emily? Emily is doing well and hanging in there. 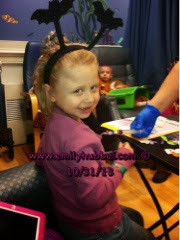 Every day Emily fights and she is so strong, and continues with a smile on her face. She just finished her first 9 weeks of 1st grade in school, and she is doing well with school. She has been having a lot of headaches lately, but we are thinking that is from the avastin. She still isn't able to be part of gym with her low platelets, so we have had to keep her out of gym. Please continue to send your love and thoughts to Emily as she continues to fight this horrible disease. As to be expected, Dad and I have good and bad days with still dealing with this disease and hearing all the horrible things that continue to happen around us. Some days are really good and other days, you just feel awful. We will always live in fear, fear of this disease, what it is doing in her body and what is happening.